Tonight I lay beside Natalie - keeping her company as she drifts off to sleep. Her little hands move about me - a reassurance that I am still there, since it is dark and she cannot see me. I have been wondering why, encroaching upon the end of this intensive phase of chemo, I have been so nervous, afraid somehow of the end. Then it hits me - I have been holding my breath... waiting for these final weeks of this phase. Some how "maintenance" (the easier phase of chemo ahead) being "the light at the end of the tunnel." But as I see the end coming I realize, it is not the end. There is still so long and far ahead. Even after two years of this next "maintenance phase" we will have 5 years of remission before she is declared healed. I just don't know if I can "hold my breath" that long. God, how do I "breath"throughout this next phase of chemo? How do I learn to live as if I am not bracing myself for great challenges, always on guard for the possibilities of what can go wrong? How does our family get through these next many years without fear of cancer? God, you are our peace, our hope, our comfort, our shield... we need you to get though every "today"
As I lay there next to Natalie, crying as I grieve the consequences of cancer, I feel small. Instead if felling like her mom or the adult, I feel small - just like her. Almost like I was just her little friend and I was spending the night with her. I felt like a little girl crying out to God. It was strange - I don't think I've ever felt that way before crying out to Him, yet somehow it was familiar. It reminded me that I am still His child. I am not expected to know everything or be everything (in other words be God). I am His little girl and He loves me. I then spoke out loud and told Him how much I love this little girl (Natalie) He put in my life. 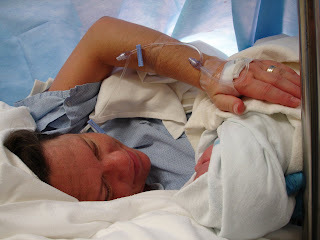 I had memories of seeing her for the first time in the operating room (above) as they brought her to me all bundled up. I could only see her little face. And then, flashing over her life to this night laying beside her, I realized how much she is a little extension of who I am... and that is why we are so attached- that I love her so. And then I realized that WE are all extension of God... created in His image. And that is why He loves us. "Natalie got to come home Tuesday night. Her immune system cell count went from 38 to 500 in just a few days, which usually takes a week or two. So we got a little miracle from God for Natalie.Natalie still has the chemo treatments on going and she is uncomfortable, has bad sores in her mouth and throat, difficult to eat, gets agitated sometimes too. Lets please continue to pray for more miracles for Natalie. I pray that the medicine will work against the cancer, but that God will make the side effects be very minimal and will heal her sores and let her be more comfortable and of course that the cell count would be reasonable to the medicine but not at the super low numbers that takes her to the hospital." - Jean M.
Dominick had to take her back to Stanford on Friday. It was long day (8AM to 9PM) Natalie and her Dad were getting another Chemo treatment. This time she again got medication that caused a severe skin reaction, she cried for a few long hours and her face and eyes became very red. The Chemo she received required that she be extremely hydrated so after 4 hours of fluids, Natalie's eyes became really puffy. Her mouth sores and other symptoms have mostly subsided but this new medicine threatens the same. We ask you to continue praying for the next two weeks as this represents the last of the really heavy treatments. - Ruth O. These next two weeks are going to be hard as we may travel to Stanford 2-3 times to receive blood transfusions in addition to our regular weekly visits. We are continually amazed how situations are presenting themselves in many of the people we meet. Just yesterday we chatted to a three people about God (some believers and some not) and shared how God has been the center of comfort though this time. I really believe because of your prayers, we are truly seeing the movement of God's hand in many of the people we meet. Praise God for Yu'All (that was for our southerners readers! :) - Dominick O.